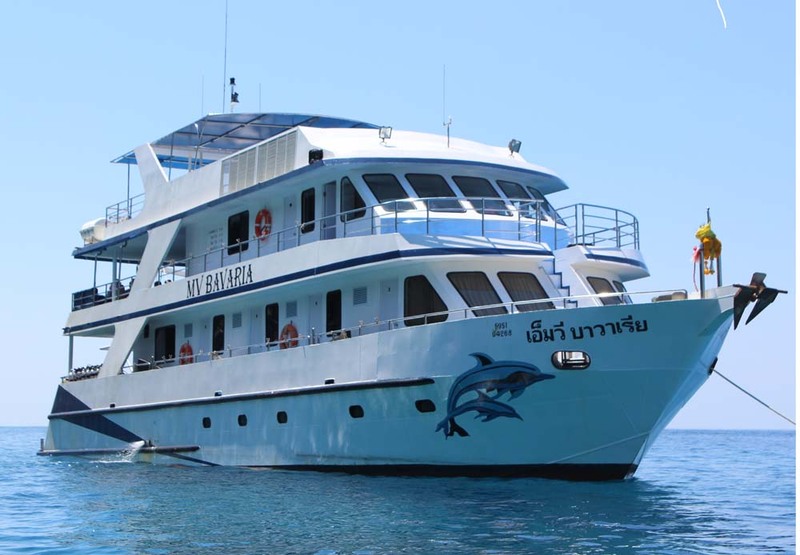 MV Bavaria is the newest of our fleet of Similan Islands liveaboard diving boats. 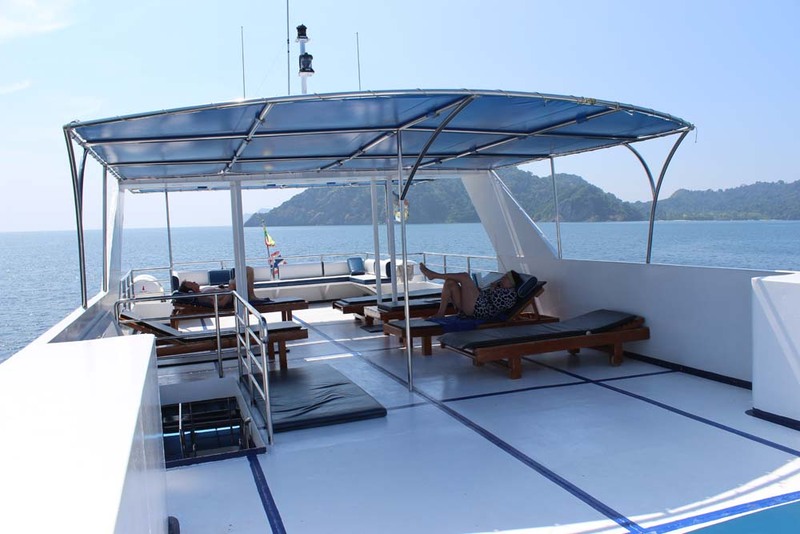 The boat was designed by an experienced & professional team especially for scuba diving safaris. Launched in 2017, the 28m. boat has successfully completed its first season and we are very proud to offer Bavaria’s trips, which include short, medium & longer liveaboard trips to Thailand’s best dive sites, and six-day trips into the Mergui Archipelago of Myanmar(Burma). 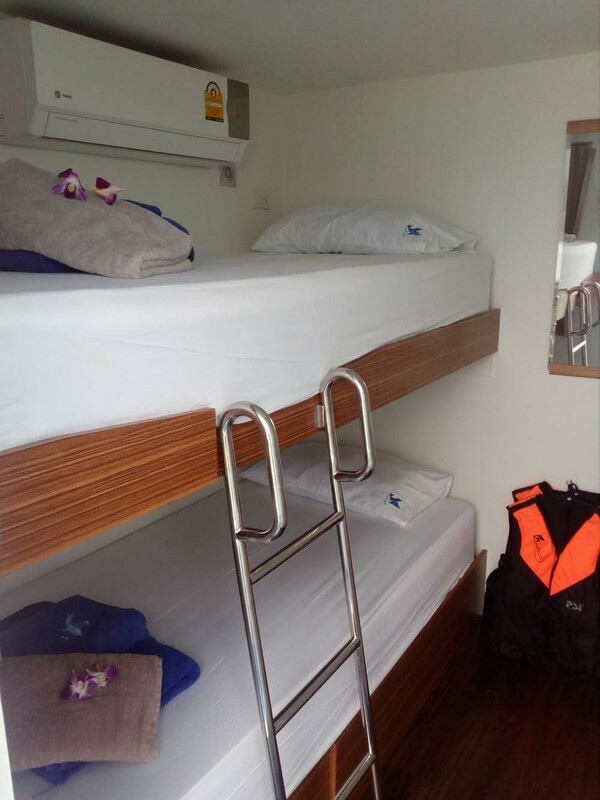 The cabins on Bavaria are clean, well-designed and air-conditioned. There are four different types, with three levels of luxury. 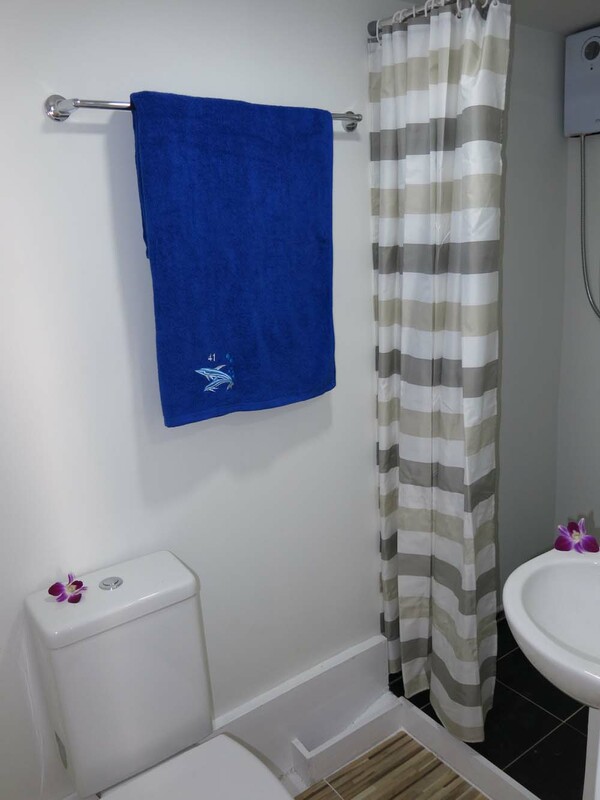 All except the two standard cabins have private bathrooms. The upper deck of Bavaria has two twin-bunk ‘standard’ cabins, which have doors that open out onto the deck, and large sea-view windows. 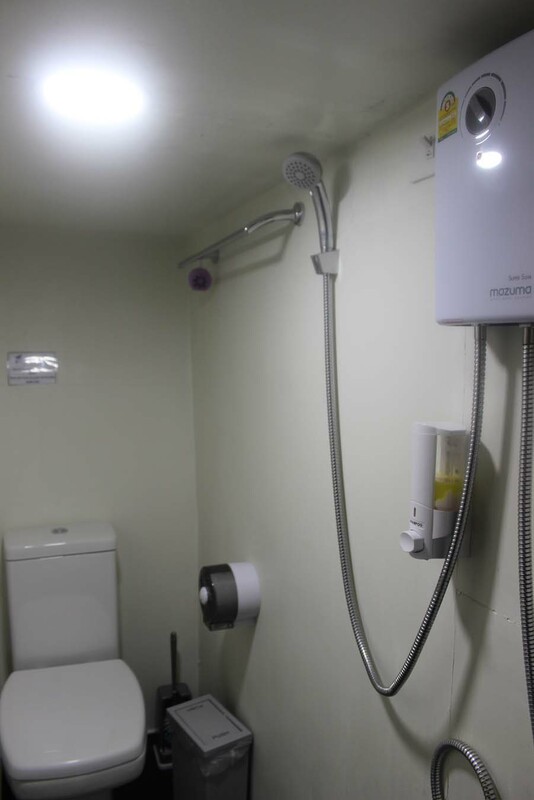 These cabins use shared bathroom facilities. 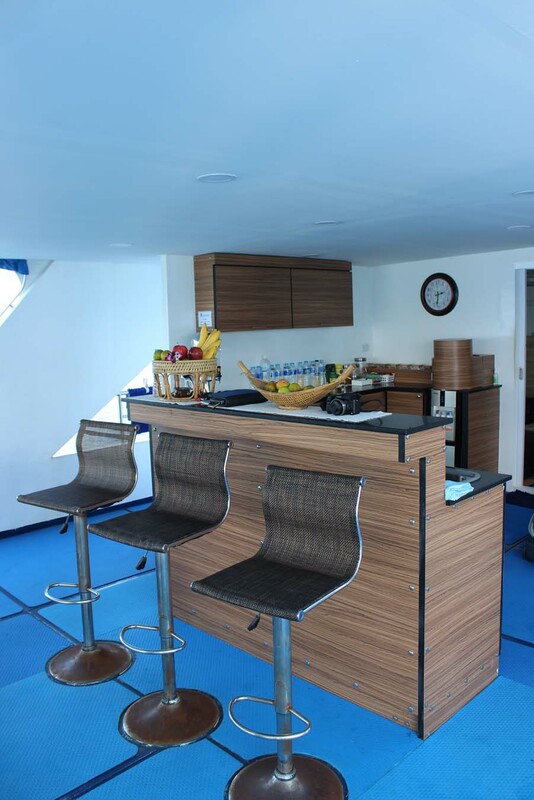 In addition to the two upper-deck standard cabins, Bavaria has eight cabins on its main deck. These are six ‘Comfort’ cabins and two ‘Deluxe cabins’. 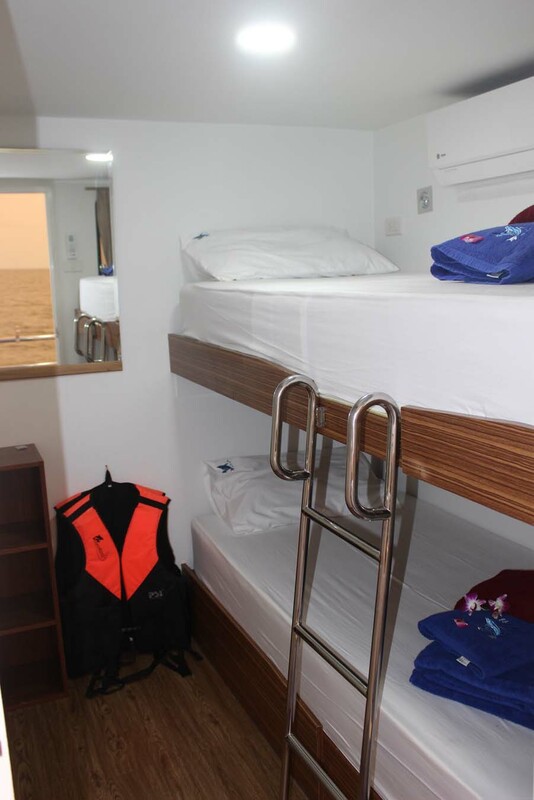 All main-deck cabins have private en suite bathrooms, sea-view windows & doors that open to the outside. 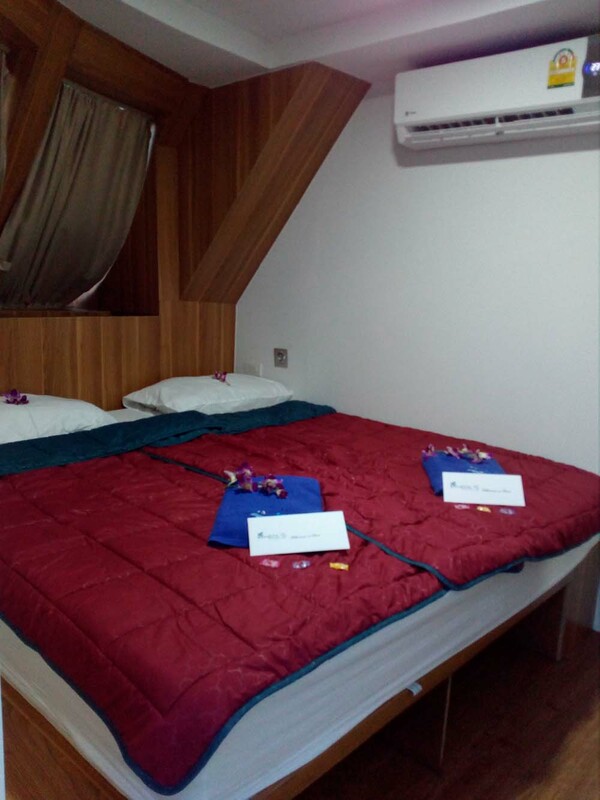 The Comfort twin cabins have a good design of bed configuration, laid out in an L-shape one above part of the other. This is the perfect way to maximise space, as well as to give both privacy and the ability for the guests to chat. 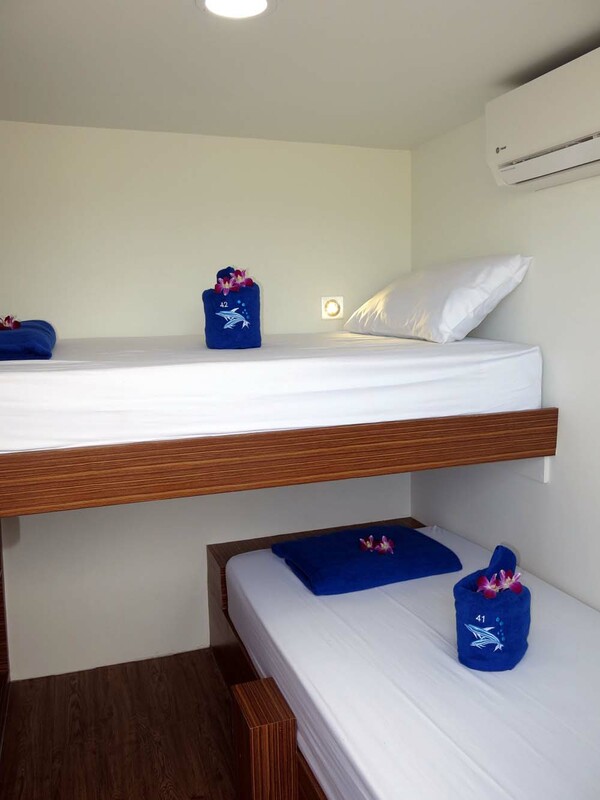 The Deluxe double-bed cabins have more space, larger bathrooms, bigger windows and large double beds. 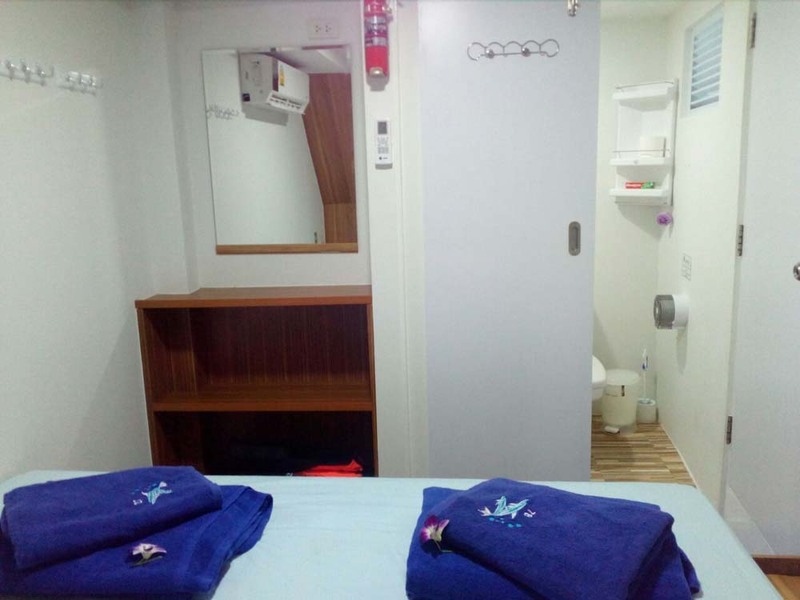 These cabins are located at the front of the boat. 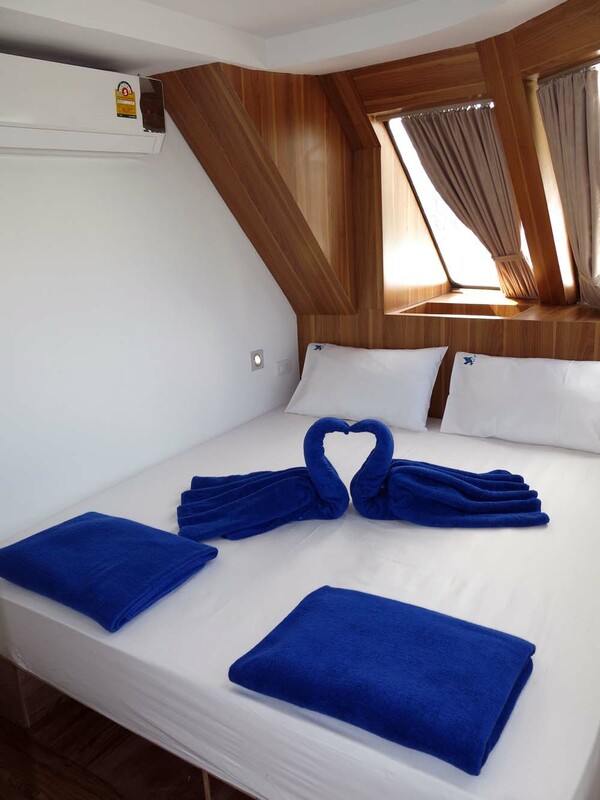 Finally, on Bavaria’s lower deck, there are two more comfort cabins, which have double beds and en suite private bathrooms. 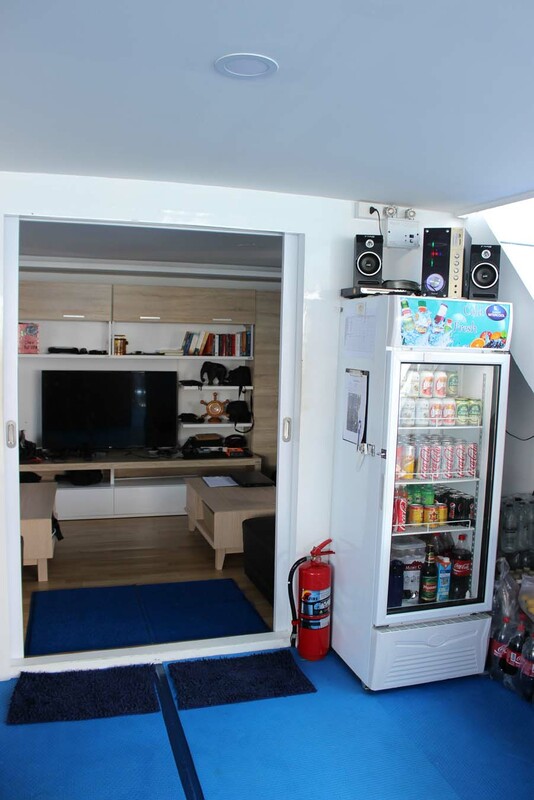 Communal areas on MV Bavaria are well designed, enabling guests to enjoy every moment of the cruises. 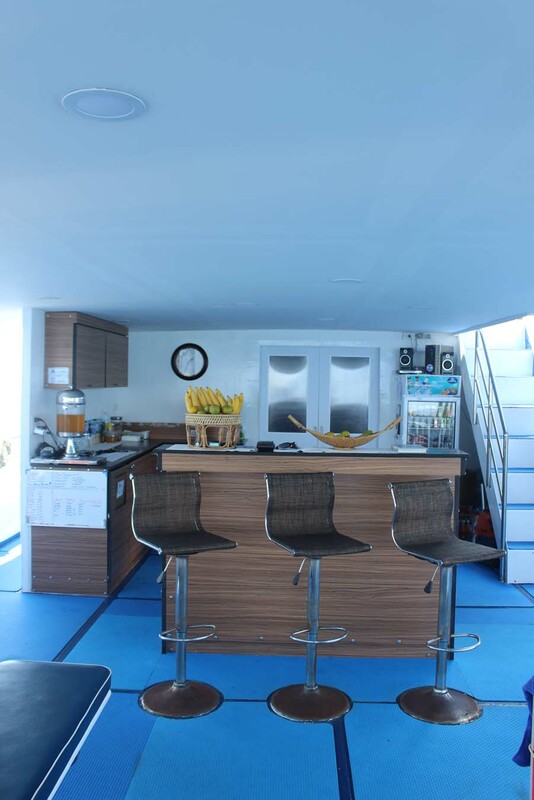 The place where guests spend most of their non-diving time is the outdoor covered dining area at the rear of the upper deck. Here, there are plenty of tables and seating, plus a serving counter. 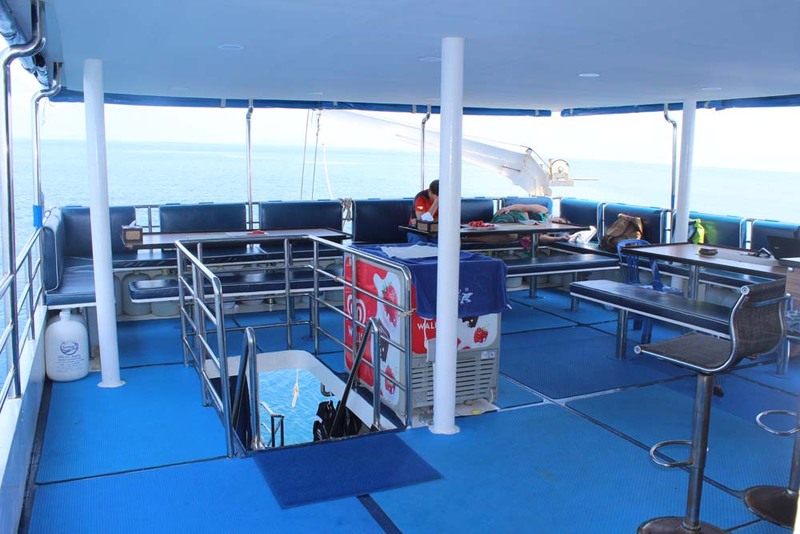 Further forward on the upper deck is the air-conditioned lounge saloon. Bavaria’s lounge is designed to offer comfort for several guests, but without taking too much space away from more-popular communal areas. Most diving guests don’t travel the world to get away from a European or North American winter to sit in air conditioning. They prefer to stay outside and enjoy the weather, the breeze and wonderful views. 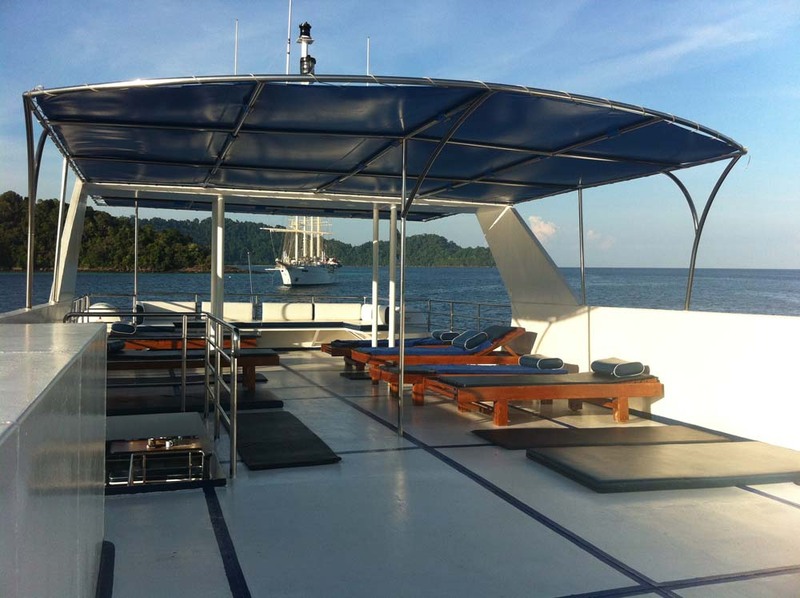 Like all of our Similan liveaboard diving boats, Bavaria has a large sundeck on its roof. This is the perfect place to sunbathe, read a book, look out for jumping dolphins, or chill & chat gazing at the star-filled night sky. 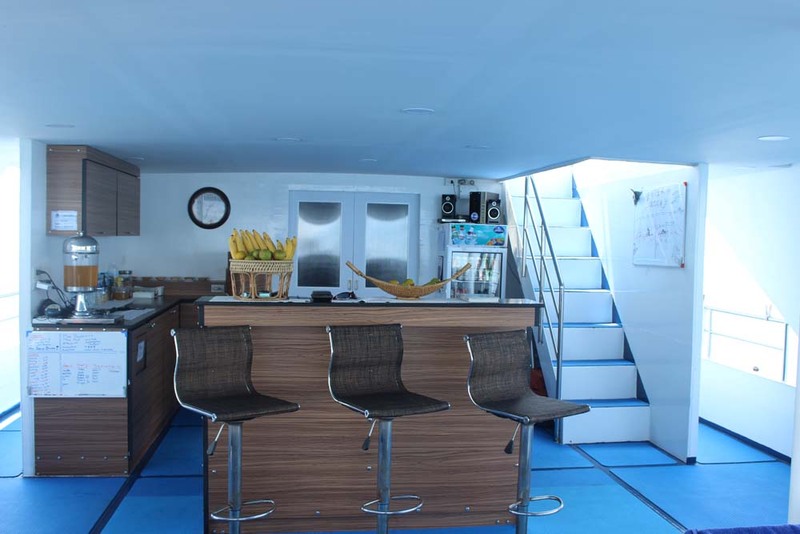 Because MV Bavaria is a purpose-built scuba diving liveaboard boat, the designers were able to properly plan the diving platform at the rear of the main deck. 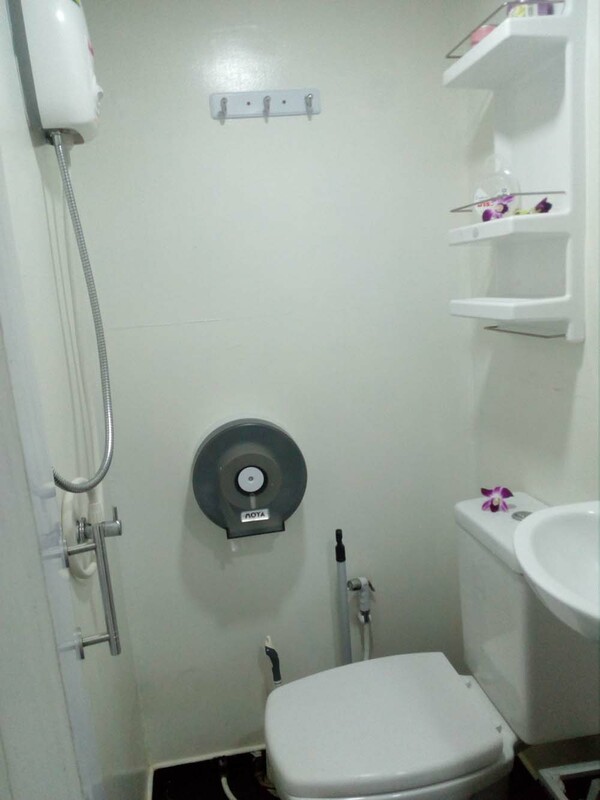 All of the necessary equipment has been fitted in the best location to enable you to gear up and walk around comfortably & safely. 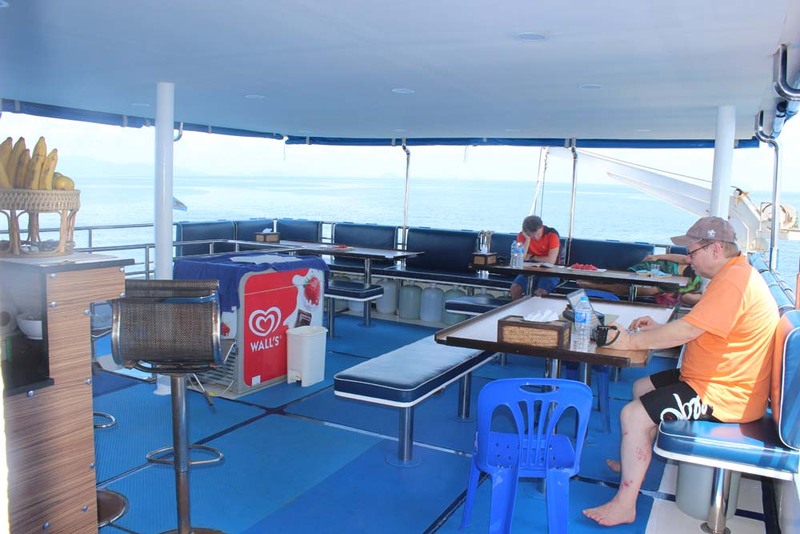 Many other Similan liveaboard boats at this size and price range are converted fishing boats, and when converting a boat’s deck layout sacrifices have to be made. This is not the case with MV Bavaria. Something else that helps MV Bavaria to stand out among its competitors is the itineraries. The season’s trips are split between Thailand & Myanmar (Burma). 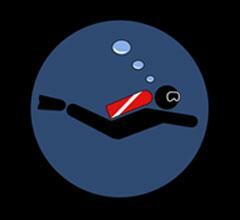 All trips into Burma are for six days & nights, with up to 22 dives at some awesome locations. 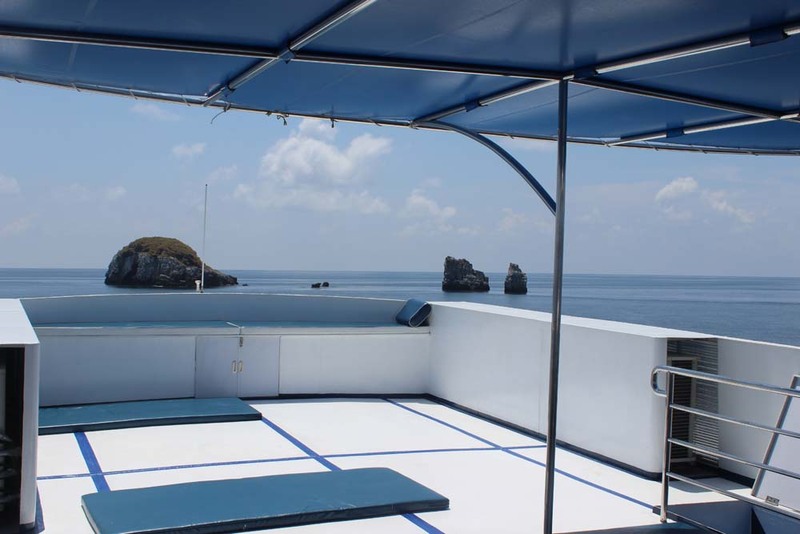 For most of the diving trips in Burma, MV Bavaria is the only boat in the area and many of the dive sites are unexplored. 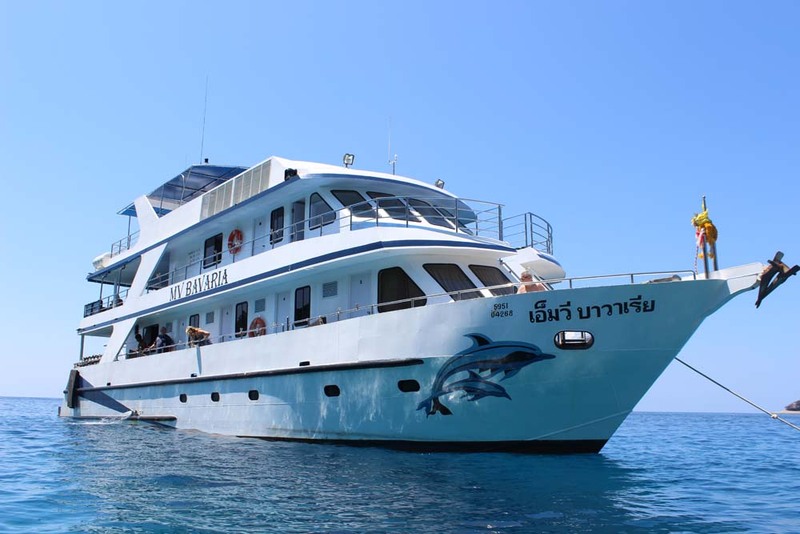 Also, for diving trips in Thailand, MV Bavaria goes out for six days & nights, but guests can choose to stay for the full duration or just join for the first part (3D/3N & 10 dives) or the second part (4D/3N & 13 dives). This is achieved by using a speedboat to either bring guests back in the afternoon mid-cruise, or take them out in the morning to start the second part of the trip. Prices, itineraries and destinations can be seen on these pages. Just scroll down or look at the top of your screen. 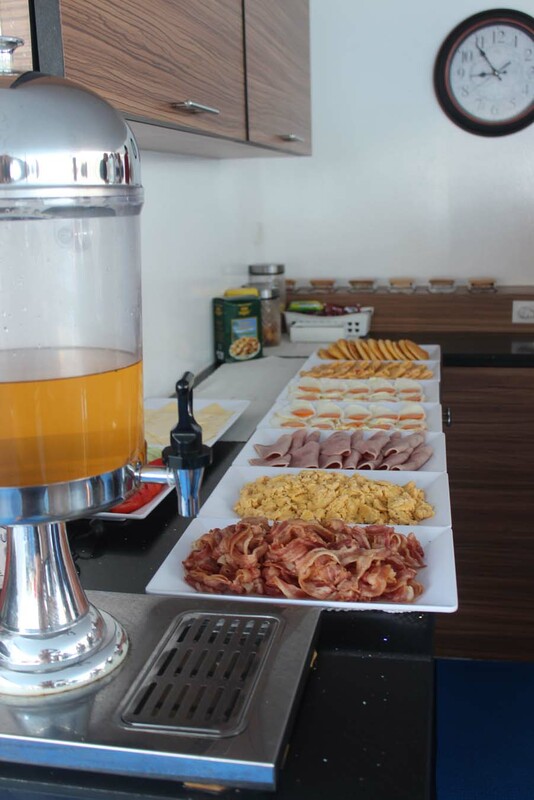 Organisation & hospitality of MV Bavaria are excellent. A professional international team with highly-experienced German management is complemented by Thai hospitality. 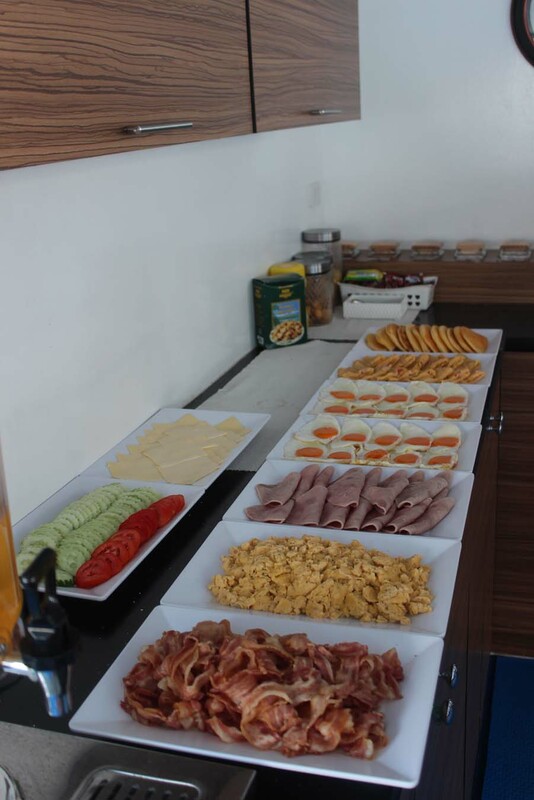 This includes some delicious food that is served throughout each day. It’s usually served buffet style, with a blend of western & Asian cuisine, but not too spicy. Vegetarians and other dietary needs can be catered for with advance notice. MV Bavaria has several itineraries. 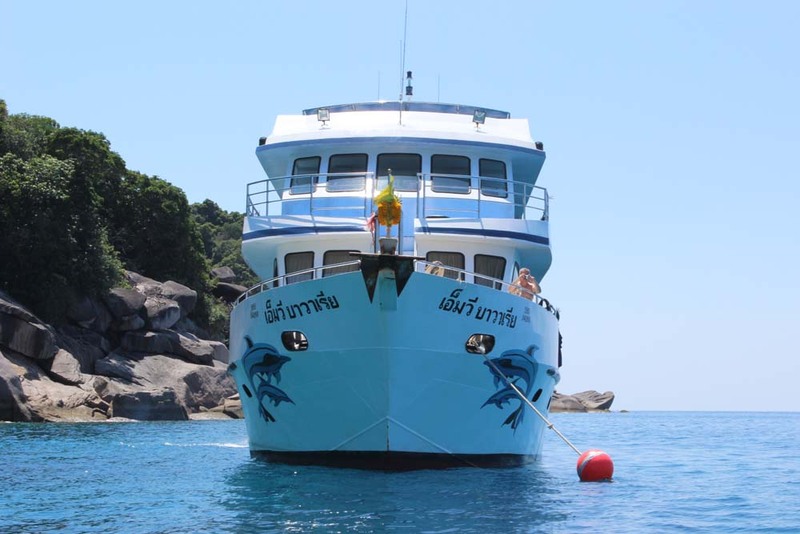 All Similan trips depart from and return to Khao Lak. Myanmar trips depart from Ranong, and guests are transferred by road from Khao Lak to Ranong. 3D/3N trips depart in the evening and guests return by transfer boat around 5pm on the final day. 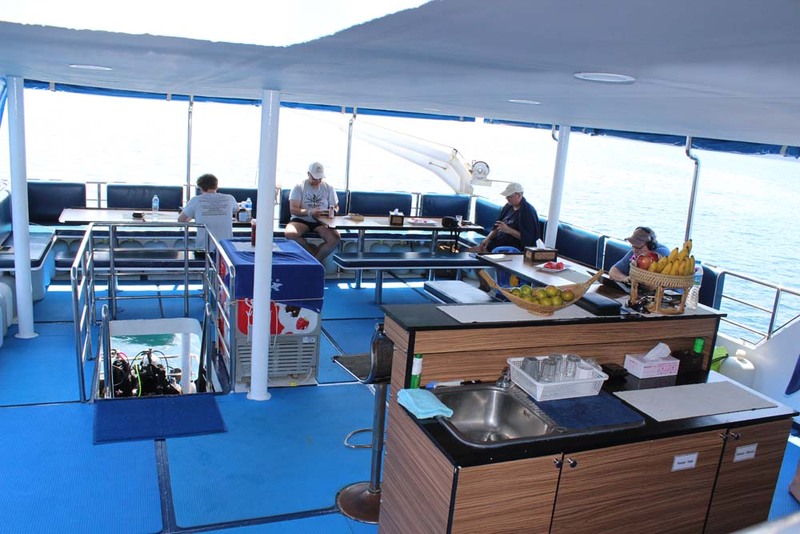 4D/3N trips depart by transfer boat at 8:00am and guests return on the main boat mid-late afternoon on the final day. 6D/6N trips in Thailand depart in the evening and return mid-late afternoon on the final day. Burma diving trips in the morning, and return late afternoon on the final day. Safety: First Aid Equipment, Emergency Stop, 4 Fire Extinguishers, 40 Life Vests. 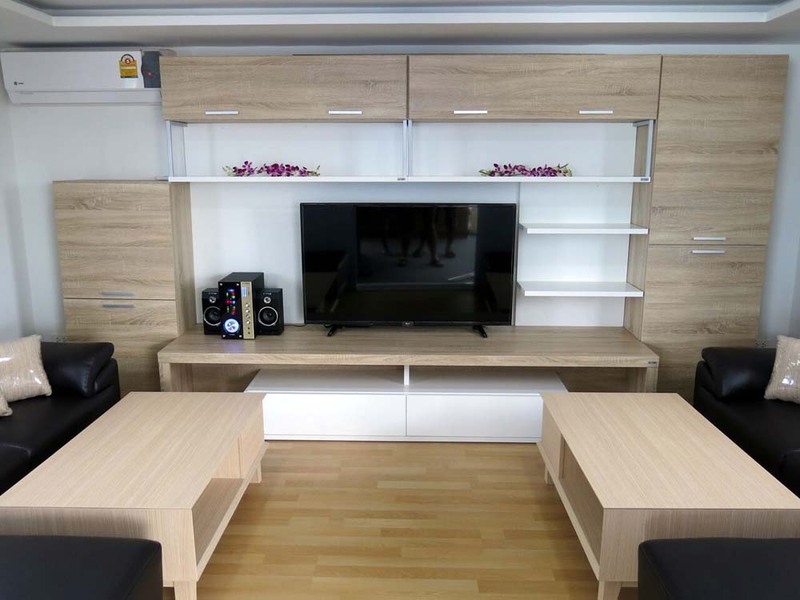 Entertainment: TV, DVD, Stereo, Library In The Salon. 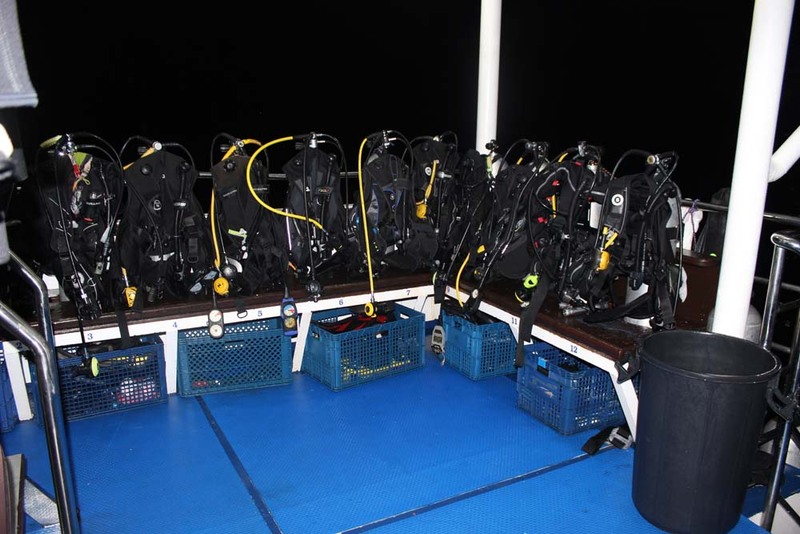 A scuba diving liveaboard trip is the best time & place to take part in a diving course. 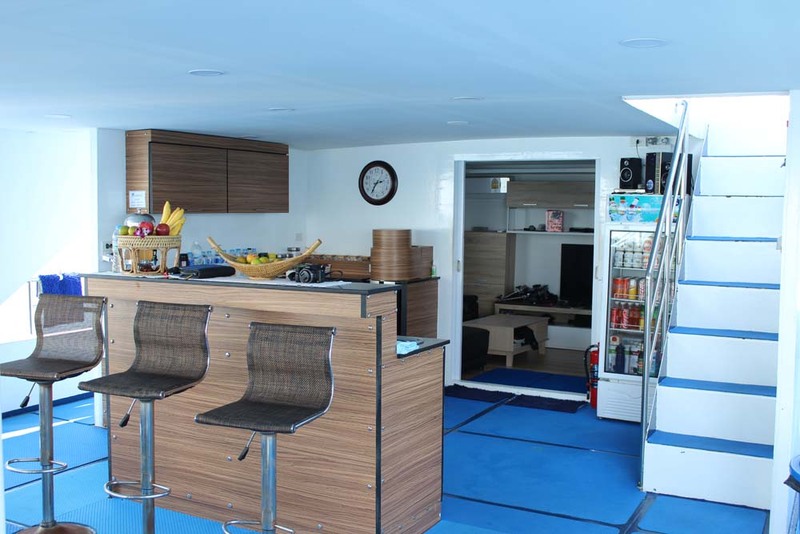 MV Bavaria offers a wide range of PADI courses in a selection of languages. 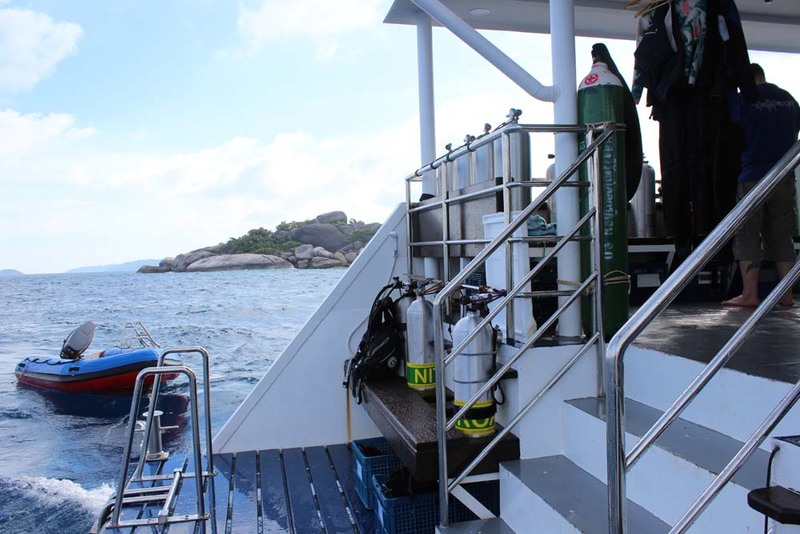 Some PADI courses can be chosen and booked on board, but it’s best to inform or ask us first, so that we can confirm availability, prices and prepare. 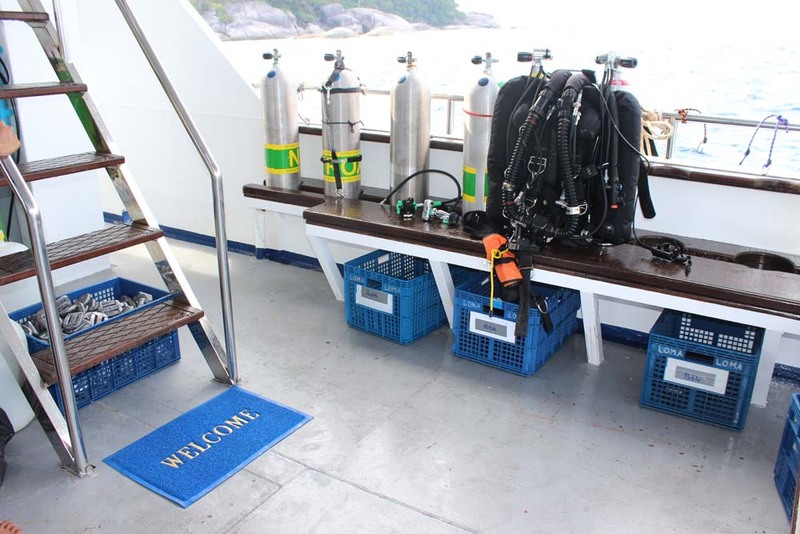 Guests need to ‘check in’ at the PADI dive centre in Khao Lak before departure. The check in time depends on the trip you plan to join. It’s necessary to check in so that any equipment can be fitted, a few forms need signing, and national park fees can be paid. Divers joining 3D/3N or 6D/6N trips in Thailand should arrive at the dive centre in Khao Lak before 4.30pm on departure day. 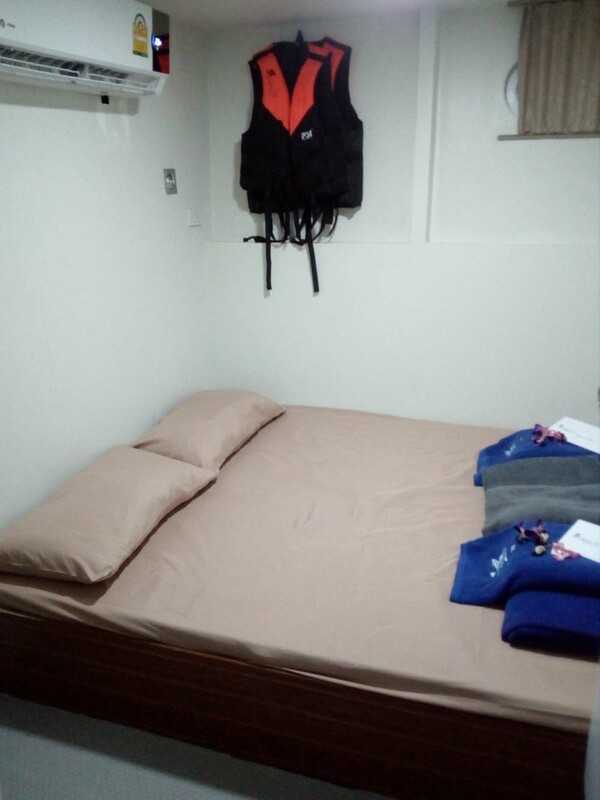 Divers joining 4D/3N trips need to 'check in' the day before departure because they are collected in the morning by the transfer team and taken directly to the boat. Divers joining trips into Burma should arrive the day before departure for check in, then before 9.00am on departure day. In addition, the preparation for Burma trips includes passport scans at least 6 weeks before the trip. Amazing diving, especially the Manta ray! Great boat staff and excellent instructor. Thanks Tina! I very much enjoyed our three day Similan liveaboard on the Bavaria. Our dive leader was excellent and we had some great dives. The boat was well organised and everyone was friendly. All guests need to pay National Marine Park fees in Thailand, and for trips into Burma a diving permit needs to be paid for and prepared at least two weeks in advance. 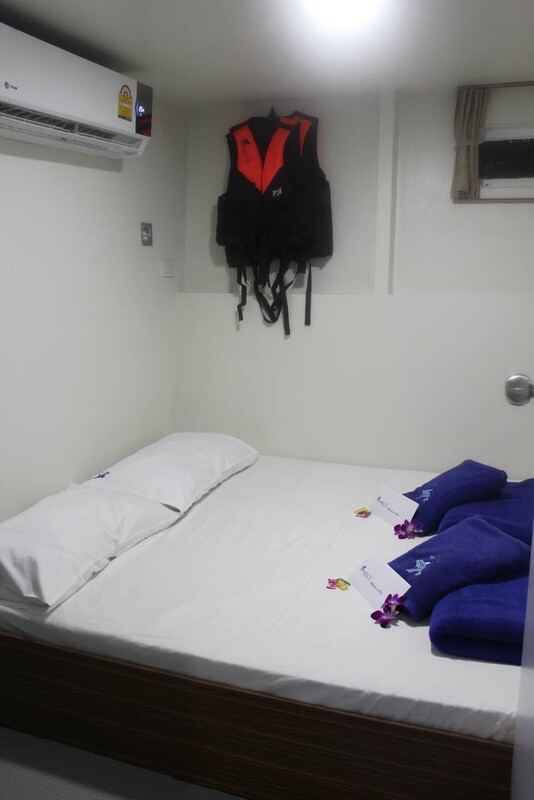 The best single-supplement rates are available for solo divers who want to pay extra for the privacy of a cabin to themselves. For twin cabins, add 50% to the cruise price. For lower deck double cabins, add 25% to the cruise price.